Worn in for a few weeks, these are genuine Knapps. If you purchase your Knapp shoes from their new owners, KBFootwear, you are buying a bona fide pair of Knapp shoes. The construction materials, primarily the sole, are slightly different but the leather, toughness and general build quality are right where a discerning consumer of military grade footwear would expect. The stitching on this 2359 is spot on, and needs to be, to hold this armor plating together. The soles are a bit spongier than in prior versions but I would call this a plus. I never understood the point of walking around on “tap shoes” all day anyway (Knapps never were, but this is an even further departure from the usual hard sole dress shoe). They are black, non marking and still oil resistant. The extra give on each footfall is, I think, a good thing for real walking around work. The laces are a thing of beauty. They are stiff and hold their shape after bending, as though there is a copper wire running through the center from aglet to aglet. Lacing these beasts was a chore because of it but I knew immediately this was a plus. 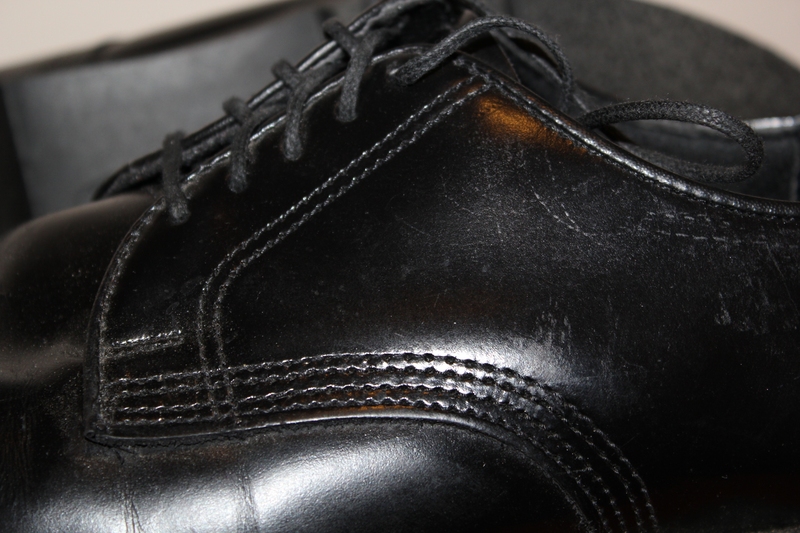 I refuse to double-knot my dress shoes because I am not 7 anymore and do not slip my shoes on and off like loafers. Slippers and deck shoes slip on and off. Work shoes are tied so they stay on and these laces refuse to come untied until you intervene. When I say the laces hold their shape, I mean it. They will not come untied accidentially. The fit on these shoes was a little off, perhaps by as much as a width. I have worn 10.5-EEE for 30 years and in this case I think I goofed by not remeasuring my feet properly before ordering. The good news is that this is only a minor problem. The difference between E, EE and EEE is the difference between death grip, snug and roomy. I can lace the shoes tighter to compensate without any issues. Next time, I am ordering the EEs. Because the shoes were a little large (again, my fault, not theirs) the break-in only came with half the usual sweet agony as the leather conformed to my step and bend. My shipping label came with a congratulatory message, telling me to take pride in the fact that I was one of the first to receive “genuine Made In America, AGAIN KB Footwear” (emphasis theirs). I do. These bad boys are my Tarsal Tanks. I am happy they have finally resolved the delays and see that the wait was worth it. Judging by the surprising amount of commentary I receive on this blog about my random shoe posts, more than a few of you were waiting for this. p.s. I receive no consideration or compensation from the folks at KB Footwear and to be perfectly honest, I have been one of their biggest critics to anyone who will listen over the years. I have a LOT of feedback for them beyond this if they are interested. Right now, I am just another customer. *Update: I was informed I had the “IronAge” reference incorrect and corrected the company name to reflect accurately. 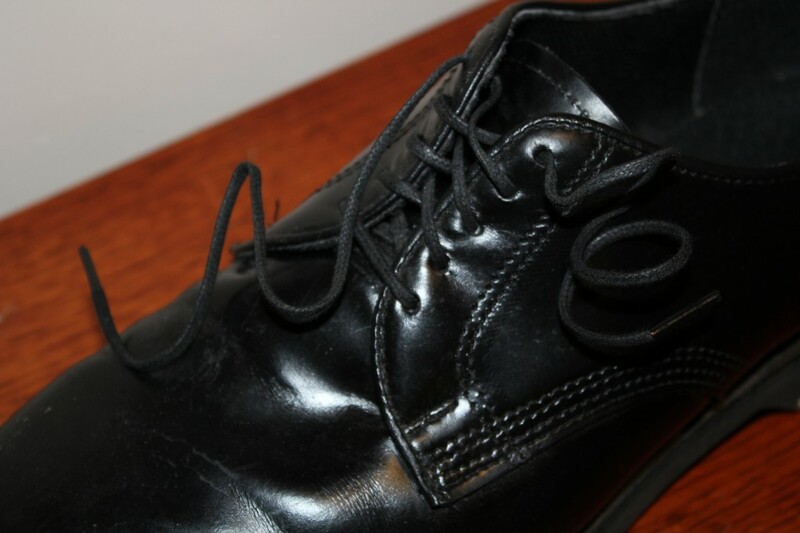 This entry was posted in Miscellaneous, Recreation, Uncategorized and tagged 2359, IronAge, KB Footwear, Knapp, leather, Plain Toe Rocker Bottom Oxford, shoes. Bookmark the permalink. Those are “cop shoes” (aka, uniform shoes) if you want to be precise. I started dressing like that when I realized my Tistonis weren’t as waterproof as they claimed during an after work Geocaching hike. You’d think the alligator leather would hold up in mud a lot better than that…the alligator does live in a swamp, after all. Even better news: with all the money I saved not buying Tistoni or Aubercy I can afford a new car. That’s how it works…right? By the way, the folks looking to me for this post on shoes are all factory and on your feet all day workers. The fine living crowd should never seek me out for fashion advice except ironically. 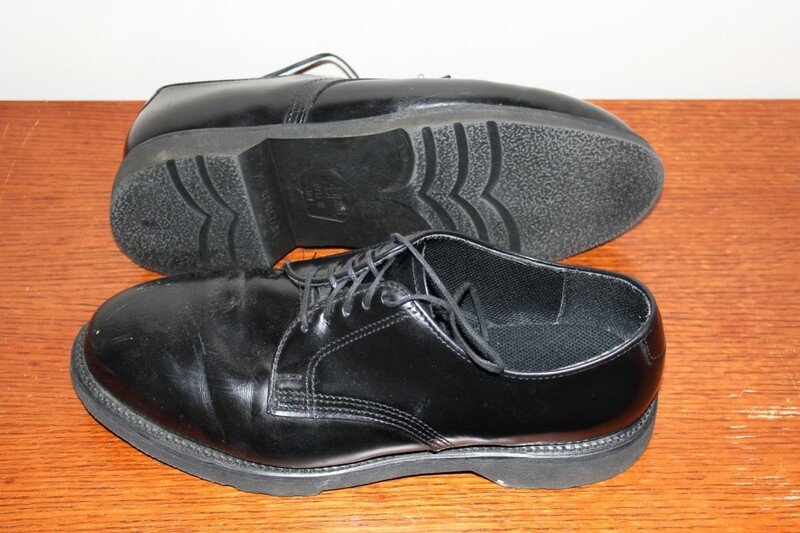 became like hen’s teeth several years ago, I discovered the Sears Diehard, whos M/N 82402 is a perfect knock-off of the Knapp 2551 “plain toe safety oxford”. Price is right @ $80 but made in China. Arggh! Still, a very good imitation of the 2551. At one point in early 90’s I got what may have been the Knapp 2539. The shoe salesman referred to them as “the old mailman’s shoe”. Anyway, glad I found this site! Funny, Ted in his first reply to this post had the same comment about me becoming a mailman. I used to get an Oxford style shoe but with my friends and I called the waffle bottom sole. I cant seem to find them anywhere. I haven’t been to find them since the early 90’s. I think you might mean Doc Martens. They used to have that sole but it was murder on my feet. Too squishy for my tastes. My father sold Knapp shoes in the 1960s and 1970s, so that is what I wore when I was a kid. I have his Knapp business card on my desk. Sadly both he and Knapp are dead (the KBFootware site says they are out of business). Sadly, this is true. KPFootwear finally gave up the ghost, and the Knapps. I’ve had to trade in my Knapps for another model. New Name Same Product: Selling KQShoes and Thorogood Brand…Order Soon Get Ready for Winter!!!! Our company has gone through a lot of pain in the last few months. First we were sued by another company then we had to close KBF back in March 2014. We have regrouped and are coming back stronger than ever, offering the same products under a new name. We are excited to serve you again, with KQShoes, Thorogood, socks, belts and accessories. I have enclosed some popular Thorogood Styles and also some KQShoes. Please let us help you into a great pair of shoes that your feet will love. KBFootwear has reopened under a new name and is, again, offering the ‘Knapp Style’ shoes!!! Kb footwear is out of business. I have had pretty good luck finding older made in USA Knapps on Ebay.I just bought two pairs of Knapp model K-34 for $23 each.I am an Ironworker and go through a pair of boots about every year or less depending on the job.